The latest chapter in the saga of Edward Snowden, whose leaks of NSA documents set off a continuing debate about the NSA mass surveillance programs, is his offer to Brazil to help it investigate U.S. spying there if that country gives him political asylum. That follows on the heels of a U.S. court ruling on Monday that the NSA’s collection of Americans’ phone data probably violated the Constitution — a ruling that Snowden and his allies said vindicated him. 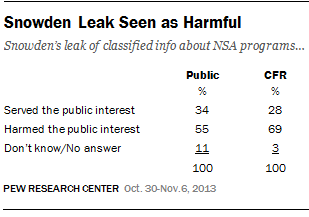 But to date, Americans on balance have had a negative view of Snowden’s leaks. In a Oct. 30-Nov.6 survey conducted before the court ruling, 55% said the leaks had harmed the public interest while 34% said it served it, with 11% expressing no opinion. There was little difference about the Snowden leak across partisan lines, except for those Republicans aligned with the Tea Party. Non-Tea Party Republicans were twice as likely (61% to 30%) to say the leak had harmed the public interest rather than served it. But Tea Party Republicans were split, with 45% seeing the leaks as harmful while 43% believed they had served the public interest. The overall public was more divided last June when asked if the release that month of the classified information about the surveillance programs supplied to news organizations by Snowden served or harmed the public interest: 49% said it served the public interest and 44% said the public interest was harmed.